This ground-breaking collection of essays outlines and explains the unique development of Latin American jurisprudence. 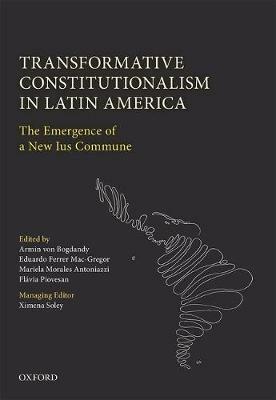 It introduces the idea of the Ius Constitutionale Commune en America Latina (ICCAL), an original Latin American path of transformative constitutionalism, to an Anglophone audience for the first time. It charts the key developments that have transformed the region and assesses the success of the constitutional projects that followed a period of authoritarian regimes in Latin America. Coined by scholars who have been documenting, conceptualizing, and comparing the development of Latin American public law for more than a decade, the term ICCAL encompasses themes that cross national borders and legal fields, taking in constitutional law, administrative law, general public international law, regional integration law, human rights, and investment law. Not only does this volume map the legal landscape, it also suggests measures to improve society via due legal process and a rights-based, supranational and regionally rooted constitutionalism. The editors contend that with the strengthening of democracy, the rule of law, and human rights, common problems such as the exclusion of wide sectors of the population from having a say in government, as well as corruption, hyper-presidentialism, and the weak normativity of the law can be combatted more effectively in future.